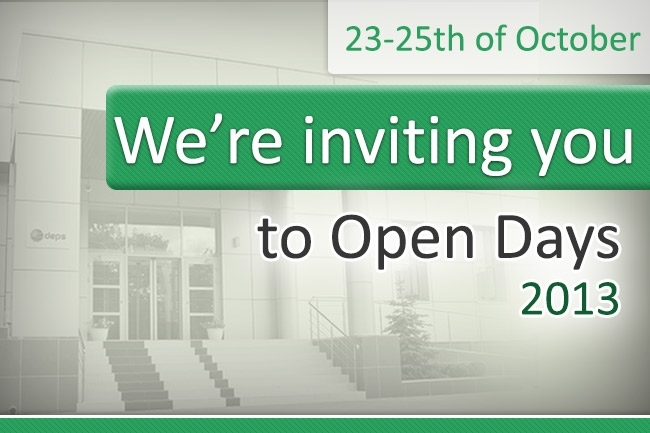 DEPS invites you to Open Days, which will take place on the 23-25th of October at our office! Competitions of work with Teleste Luminato stations, valuable prizes to the winners and many other things! During the holding of OPEN DAYS you will be able to get acquainted and communicate with our CEOs and engineers of the company personally, take a look at the work of the DEPS company team from inside and see new products and interesting solutions. And of course, feel the whole our cordiality and hospitality taken with flavored barbecue and excellent beer! During all days (23—25th of October) at our office the representatives of SSD (Svyaz’StroyDetal’, Russia), Teleste (Finland), INNO Instrument (South Korea), Terra (Lithuania) and BDCOM (China) will be ready to answer all the questions concerning to the producible equipment! On the 24th of October, within the framework of «Open Days», a free of charge seminar under the participation of the representatives of SSD (Svyaz’StroyDetal’, Russia), Teleste (Finland), Inno Instrument (South Korea), Terra (Lithuania) and BDCOM (China) will be held. 13:30 — «Modern network solutions of CJSC «Svyaz’StroyDetal», Yuriy Rozov, SSD, Russia. 14:00 — «Digital TV from Teleste — is very simply!» Juha Kangas, Teleste, Finland. 14:30 — «PON Technology based networks from BDCOM», Andrey Konovalov (DEPS), Wang Pingping, the BDCOM engineer will answer the questions . At the conclusion of workshops all the visitors are welcome to demonstrate their professional competence in the cable splicing and splitting and placing cables into fiber-optic closures contests. The contests of work with the fusion splicers, coaxial cables and twisted pair cables are also going to be held. The winners will get one of our SUPER-PRIZES: INNO Instrument fiber cleaver D2, fiber cable tools set or FTTH stripper! VALUEABLE PRIZES guaranteed to all the participants of the competition! Yuriy Rozov, SSD, Russia, Hwang Chul Hee, INNO Instrument, South Korea, Juha Kangas, Teleste, Finland, Juozas Labutis, Terra, Lithuania и Wang Pingping, BDCOM, China) will judge the competition, select the winner and give the prizes! The registration for the competitions and the seminar is compulsory! We are waiting for you on the 23-25th of October. Our address: 18, Bubnova str. A bus from KyivExpoPlaza (2B, Sal’utna str.) to DEPS Company will depart at 12:00, 14:00 and 16:00 during all the exhibition days of EEBC-2013 (on the 25th of October a bus will depart at 12:00). If you have any question concerning the transfer from KyivExpoPlaza, please call our responsible manager (tel. : +380-67-101-11-82), who will be waiting for you at the exit B of KyivExpoPlaza. All the details you can get from our managers. Мlook at our photo-page to Facebook.